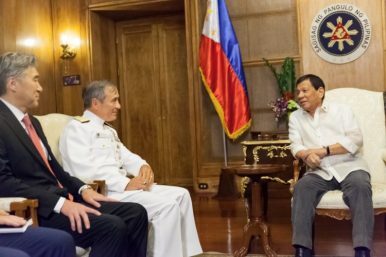 From August 23-24, U.S. Pacific Command (PACOM) commander Admiral Harry Harris visited the Philippines and met with key officials including President Rodrigo Duterte. His visit reaffirmed the ongoing cooperation being forged by the two allies in spite of clear setbacks under Duterte’s reign thus far. The United States and the Philippines have officially been treaty allies since the inking of the Mutual Defense Treaty in 1951 and have a long history of security collaboration (See: “The US-Philippine Alliance Under Duterte: A Path to Recalibration”). Although the environment for bilateral cooperation has been somewhat complicated since Duterte took power last June and vowed to forge a more independent foreign policy that diversifies Manila’s alignments away from Washington and towards other powers like China and Russia, important collaboration in areas ranging from counter-terrorism to maritime security is still continuing. On counter-terrorism, U.S. support for the Armed Forces of the Philippines (AFP) has only intensified in recent months as Manila has confronted Islamic State-linked militants in the southern city of Marawi, which has exposed its well-known limitations (See: “US Terror Aid to Philippines Signals Enduring Defense Ties Under Duterte”). And on maritime security, despite the weakening of the Philippines’ South China Sea position as Duterte seeks a broader accommodation with China, important U.S. assistance to Manila has continued, with notable developments including bilateral interactions focused on the Sulu-Sulawesi Seas as well as the transfer of a high-tech radar balloon last week (See: “Beware the New China-Philippines South China Sea Deal”). Last week, Harris paid a visit to the Philippines in the latest in a series of visits by U.S. officials, ahead of U.S. President Donald Trump’s expected meeting with Duterte in Manila later this year when he will attend the next round of ASEAN summitry there (See: “Why Trump Should Go To APEC and EAS in Vietnam and the Philippines”). Other officials, including commander of the U.S. Pacific Fleet Admiral Scott Swift and U.S. Marine Corps General Robert B. Neller, have also visited the Southeast Asian state over the summer. According to the U.S. Embassy in Manila, Harris met with top Philippine officials including Duterte as well as Defense Secretary Delfin Lorenzana, AFP chief Eduardo Ano, and Foreign Secretary Alan Peter Cayetano, in Manila. He also participated in a wreath laying ceremony at the Heroes’ Cemetery in Taguig to honor Filipino military heroes and made a trip to Zamboanga which included meeting Commander of Western Mindanao Command Lt. Gen. Carlito Galvez Jr. The meetings, the Embassy said in the short public statement, predictably focused on “upcoming bilateral engagements, recent aid and military assistance that the U.S. government has provided to the Philippines, as well as opportunities for additional U.S. support in Marawi,” in addition to other issues of regional concern such as North Korea. The focus in the statement on the Marawi situation, instead of the South China Sea, reflects both the urgency of the terrorism threat as well as the sensitivity on that aspect of maritime cooperation thus far during Duterte’s reign. And as useful as such public statements are, it is important to recall, as I have noted previously, that the U.S. and Philippine officials have said privately that the lack of public disclosure about specifics in U.S.-Philippine defense cooperation in the Duterte era obscures the inroads being made despite the complications that remain.